A TV spinoff that lacks enough energy to spin, The Avengers is an ineptly written, woefully miscast disaster. You'd have a much better time staring at a picture of Uma Thurman in her leather catsuit for two hours than actually watching the movie. Unfortunate remake of what was a classic. No expert on the show, I've seen enough to think adapting it into a modern film seems like a bad idea from the start. Although period fashions make for some distinctive visuals, the tone of the show was never an outright loving spoof like Austin Powers, but a more amused "This is all so ridiculous" vibe which modern genre audiences generally hate. The repartee would need 2 be quite witty to rise above this but it doesn't & the 2 leads never seem to be having fun like the originals did. I suspect the movie is a victim of ruthless test screenings, with the studio becoming ever more nervous and demanding more cuts to anything that might distract audiences. How else can anyone explain the complete non-presence of someone on screen as the usually highly-charismatic Sean Connery as the villain Sir August de Wynter. Again I have to assume he originally had a much larger role and it was edited down to nothing. So much for the baddies. I just remembered that this movie exists, and I had to laugh uncontrollably. Then the laughter turned to tears and relentless sobbing. I'm writing this on my phone whilst lying under my bed. I ... I don't think I'm coming back out. More Britishisms than you can shake your cup of tea at. Also, completely nonsensical. Not offensively bad, but there's no reason to watch this, despite the all-star cast. An oddball movie that doesn't quite find its feet before it ends. 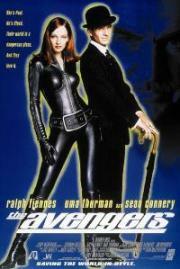 The Avengers has to be the worst film adaption of a tv series ever. I never watched the tv series as it was well before my time. But I do know that this horrible film adaption is completely disrespectful and unrecognisable of its much loved source material. I can only hope and assume that the likes of Fiennes, Thurman and Connery got offered more money than they could refuse. Otherwise I have absolutely no idea why they would associate themselves with this disastrously nonsensical mess.